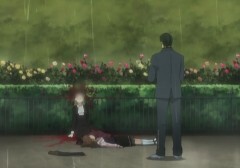 Episode III-VI of Umineko no Naku Koro ni, “promotion”, begins on 1:30PM right after the end of the previous episode, where Eva is still wailing about the loss of her husband. On the other hand, George is still pretty calm and more concerned about others despite having lost both his lover and father, which is a fact not lost on Battler. Unlike his mother, George is trying to hold in his pain and barely expresses the anguish he must be feeling, notwithstanding Battler’s point that crying is just for times like these, who is doing just that for the loss of his own parents. Episode III-V of Umineko no Naku Koro ni, “queening square”, begins in the guest house where everyone has been holed up in, and people are alarmed that Rosa and Maria have gone out and have not returned yet. Some are also annoyed that they went out without locking the door behind them. Rudolph heads to the garden in search of the two. When Hideyoshi tells the news to Eva, who has been resting in a room, she panics and exclaims that they must not go out to the garden because there is a witch. Things are not easier for Eva as she also continues to get severe headaches. Outside, Rudolph has just found the corpses of Rosa and Maria. 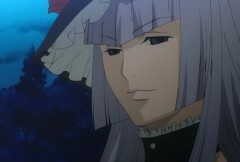 Episode III-IV of Umineko no Naku Koro ni, “isolated pawn”, continues from the previous episode where Eva had just found the gold. Eva is not the only one who figured out the inscription and found the gold, however. Eva is surprised by the arrival of Rosa, who congratulates her about finding the gold a bit earlier and getting a huge boost with inheriting the headship of the family. Both women are carrying guns, and with the huge wealth involved, it could be a very tense moment. Tokyo Magnitude 8.0 is about a sister and brother trying to return home with the help of a woman they meet after Tokyo is half-destroyed by a magnitude 8.0 earthquake. Many of the things they have taken for granted in their normal life are no longer available, and their journey is made even harder by the aftershocks that continue to plague the city. Episode III-III of Umineko no Naku Koro ni, “positional play”, begins with the Beatrice of the present and the Beatrice of the past facing each other in the garden. The present Beatrice is respectful enough towards her former teacher, but there is an irreconcilable difference in opinion: the previous Beatrice had repeatedly taught her former student that the powers of an Endless Witch must not be used to harm people. The present Beatrice lightheartedly defends herself by saying that it’s just a game to deal with the boredom, but the previous Beatrice intends to take back her name and title as Beatrice, the Endless Witch.